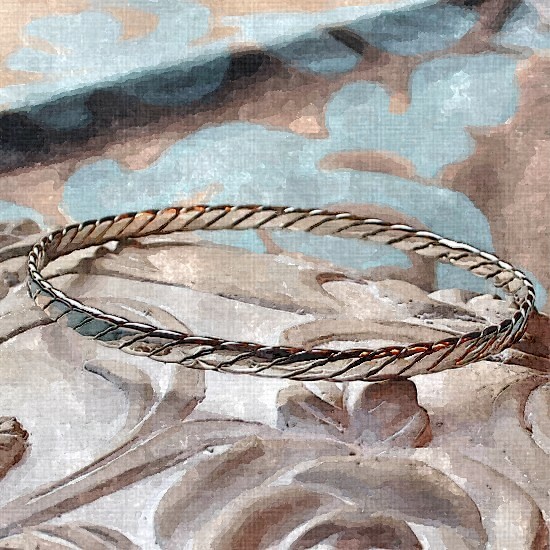 I thought it might just be the perfect time to do a ‘giveaway’, what with Christmas just around the corner, and this beautiful woven silver bangle just desperate for a new home! My intention is to make a collection of these bangles, each of differing widths, so that they can be bought as a set and worn stacked together on the arm. 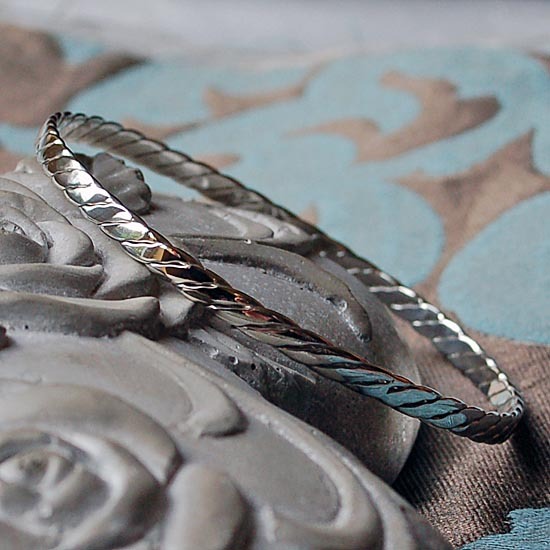 This bangle will fit an average female wrist, being 21 cm in diameter, and the band is approximately 4 mm wide. I started with three lengths of sterling silver wire of around 1.6mm diameter. 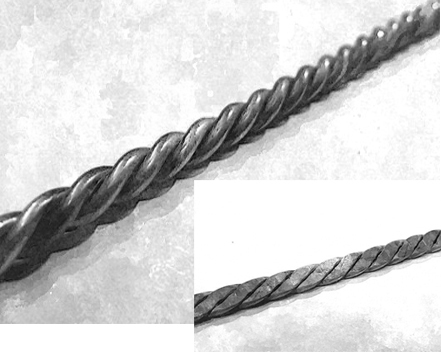 The three lengths were bound tightly together with iron binding wire and then the ends fluxed and soldered to hold them firmly together and in place. Next, the bundle of wires was secured in a vice and, using a pair of mole grips to hold one end, the bundle was twisted around and around to form a uniform spiral. Twisting the silver like this causes it to work harden significantly; before any further progress could be made with the piece it had to be annealed (heated) to relax it and make it malleable once more. The next step was to flatten the spiral. This could be done easily with a rolling mill (if I had one), but my methods are more basic but probably a lot more satisfying – the use of a hammer can be very therapeutic! 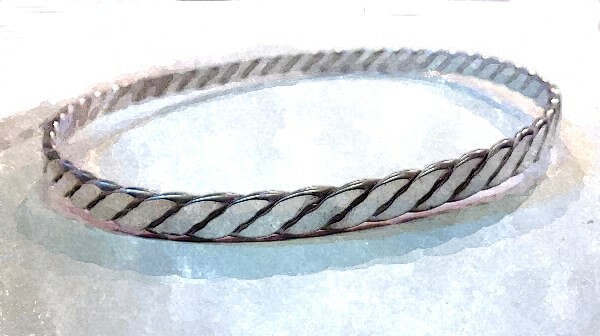 Using a hammer and a steel block, I flattened out the spiral into a long piece of woven silver that I could then shape into the bangle. As you hammer the twisted metal, the weave loosens and the pattern starts to appear. 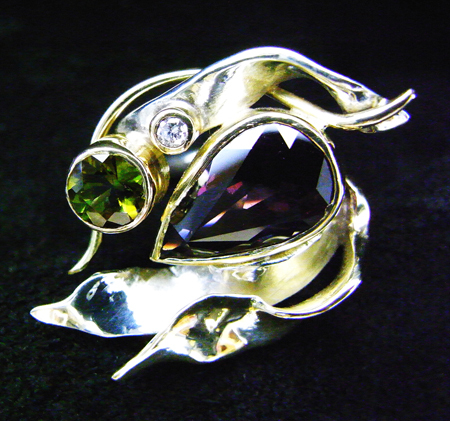 Repeated annealing is necessary during this process to keep the silver workable. 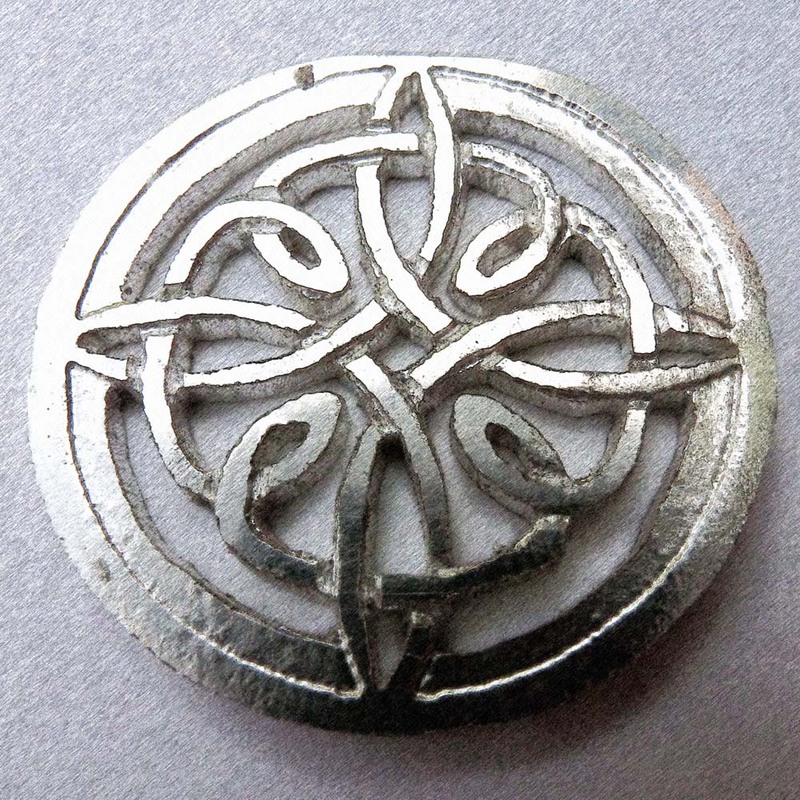 Once the correct thickness and length is achieved the piece is cut, fluxed and soldered together to form a circle. Thus the ‘giveaway’: I’ll be doing this via Twitter and tweeting regularly over the next week to get as many involved as possible. For the chance to receive this beautiful handmade solid sterling silver bangle free of charge, you will need to follow me on Twitter (@anabenedicta) and either retweet one of my #BangleGiveaway tweets or give me a mention including the #BangleGiveaway tag – simple! The closing date for this giveaway is Sunday, 16 December 2012 at 12 noon GMT – the winner will be chosen at random from all qualifying followers using Twitrand and will be announced by 6:00pm on 16 December. Go on, join in the fun and win a beautiful free silver stocking filler this Christmas. Good luck! Please note that only UK entrants will be guaranteed to receive the bangle before Christmas; overseas entrants are welcome but may not receive their gift until January 2013 as I am unable to guarantee international postage times. Well, I had made one decision at least … I would make a ring. Great. Fantastic. Now what? With my background being in law and not, I thought, a creative bone in my body, how was I going to even come up with a design for this ring, let alone actually muster the skills to craft it. Help! Fortunately, at Flux n Flame, there was no need for me to worry. I was very lucky to have an extremely enthusiastic and talented jewellery designer to guide me (almost by the hand!) through the day. Fran Barker (who is sadly no longer teaching at Flux n Flame) was to be so inspirational and helped me out of a tight spot or two on that first day. I’m not at all sure that I would have caught the jewellery-making bug so badly if it hadn’t been for her! You can see an example of her stunning work below. After poring over design after design in the books which had been made available to us, I still wasn’t confident that I could attempt any of them. Finally, I decided on a simple plain band ring to be cut from silver sheet. Now the fun was to start in earnest. 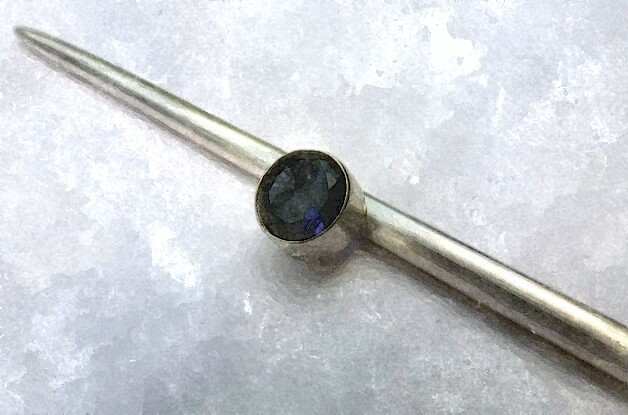 After measuring my finger and working out what size ring I needed to make, I then had to master the first evil thing that every budding jeweller has to face – the jeweller’s saw and piercing blades. Don’t sound too scary, do they – but believe you me, there is nothing more frustrating when you start out on this path than learning to pierce out a shape in metal – just when you think you’ve got it, PING, your saw blade snaps in two and you find yourself spending the next 10 minutes fighting to fit a new blade into the frame. And it does this again and again and again …aaagghh!! Good practice though, as you really do need to get this technique under your belt. Having marked up and finally managed to pierce out the rectangular piece of silver that was to miraculously turn into a ring, it was suggested that I might like to add some texture to the surface to provide a bit of interest. I chose to have a go at reticulation, which produces a rippled effect on the surface of the sheet. Of course, during the heating process to achieve this finish I took things just a tad too far, and ended up melting a tiny hole in the silver sheet. Ruined. Or, if you have Fran’s positive outlook on things, just a minor challenge to be overcome! “You could decorate the band with some silver and gold balls – it’s great fun making silver balls, and they will cover up the hole so nobody will notice” . Positivity … just what I needed to hear as I hurled all my tools off the beginner’s workbench! Making tiny silver and gold balls was fun, and I wouldn’t have got the chance to have a go but for my mistake. Always look for the silver lining to each and every cloud. Here’s the finished article – not exactly perfect, but a perfect first attempt. Where will it lead me next? The texture on the surface of this drop pendant is achieved with reticulation. Essentially this involves repeated heating of the sterling silver to force a layer of fine (100% pure) silver to accumulate on the surface. This process of heating is called “annealing”. Once the pure silver layer is present, the torch flame is targeted on specific areas of the surface, causing the fine silver to melt and run – removing the flame abruptly causes the surface to crumple and fold into random patterns. As such, the effect can never be repeated exactly, making each piece truly unique. This technique relies for its success on the difference between melting points and cooling rates within the piece of metal – when one area contracts more than another, the rippling effect occurs. The process is best performed on sheet metal which is at least 1mm thick. 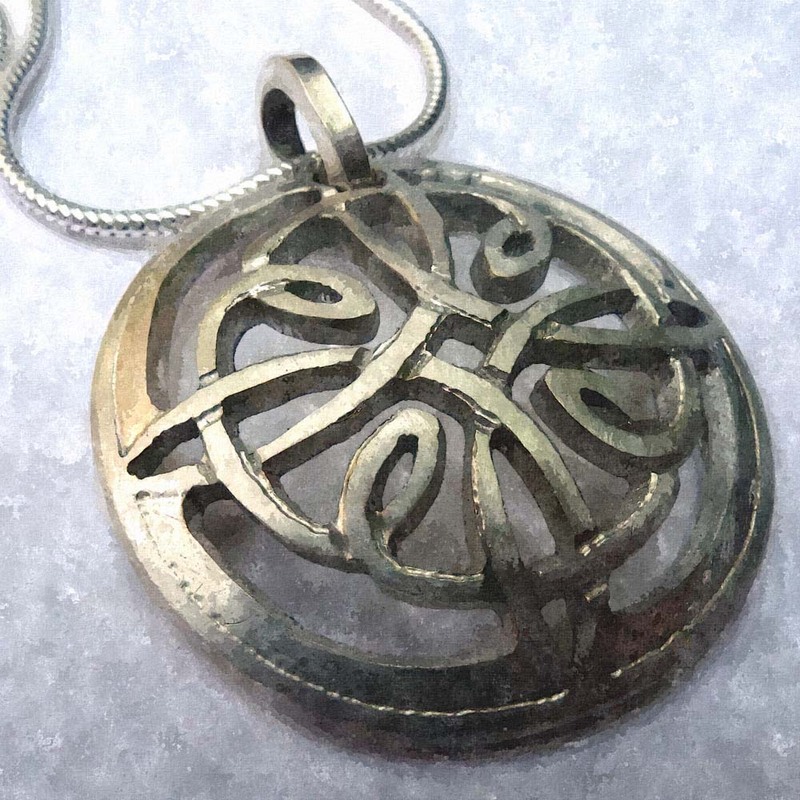 Silver, gold or brass can be used and the technique may be carried out before or after cutting and shaping of the final design. 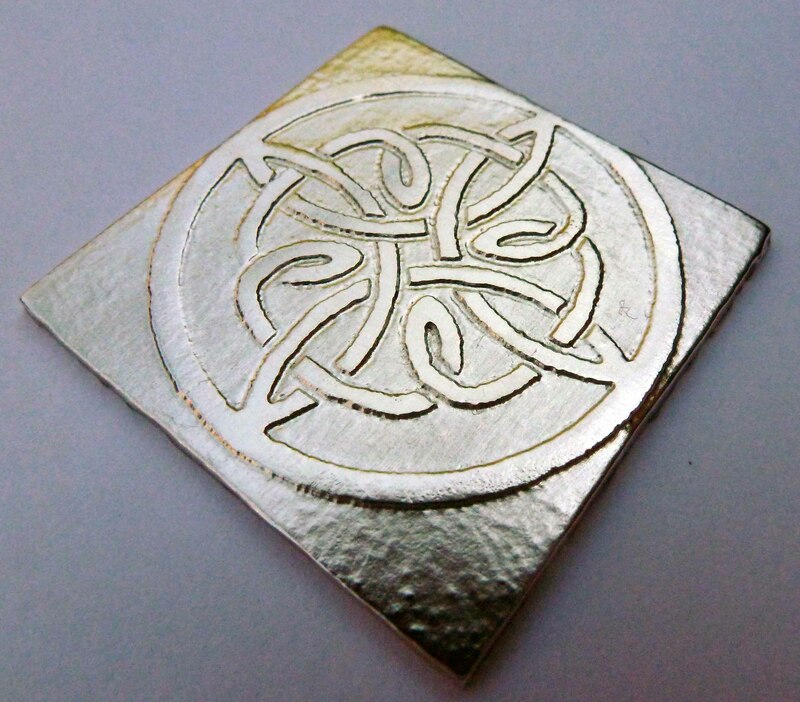 Another idea is to add very fine pieces of fine silver in patterns on the surface of the sheet. Repeated annealing of the sheet is not necessary for this method to succeed as the fine silver cuttings will disrupt the surface tension of the sheet metal when it’s heated. 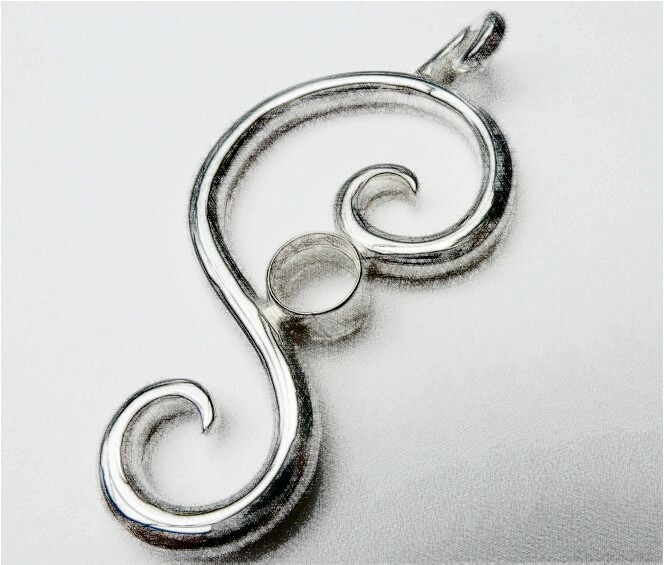 The fine silver does not melt and can be moved around in the molten surface of the sheet to make interesting patterns. As the piece cools, the different contraction rates of the metals will cause ridges and ripples to form on the surface creating a unique textured finish. 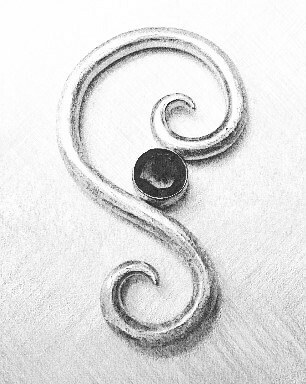 This technique is a very easy and interesting way to add a unique character to the metal you are going to use for your design and you can be sure that no-one will ever be able to repeat it exactly! The drive down from my Hampshire home to the jewellery school in Dorset for my first experiment in the art of jewellery making was a delight in itself. It was an early December morning and Jack Frost had been out and about overnight, leaving a covering of sparkling white over hedgerows and trees, and with the dawn mist still lingering in the valleys, you could almost imagine that the world had been adorned in silver dust! Flux ‘n’ Flame is located in a very rural part of Dorset and is housed in a stunning barn conversion, beautifully fitted out as a workshop for a maximum of 8 students, and with 2 tutors per session, you really do get lots of help and guidance throughout the course. The most wonderful thing about this jewellery school (unusually I believe), is there is no set structure to the “course”. You get to decide what you want to make and the tutors will help you achieve it, demonstrating, advising and encouraging you every step of the way. It really gives you the freedom from the start to explore your own ideas and come up with a truly unique design. No worries either if you just can’t manage this bit on your own – they have a library full of wonderful books from which you can’t fail to find something to inspire your creative side. On arrival I was welcomed by Jesa and Fran who made me feel instantly at home by offering me a steaming mug of tea. As others on the course gradually arrived, we all started to feel more relaxed and excited at the prospect of what was to come. Fran gave us all a quick tour of the workshop, explaining along the way what some of the different tools and equipment were and what they could be used for. Some of my fellow students had dabbled in jewellery making before and were thus able to get stuck in almost immediately. For the rest of us newbies it took a little while to decide what piece we thought we might be able to manage at our first attempt. One or two chose to make bangles, another a brooch, but I took the simplest option and started with a ring. My ring was to be a simple but wide plain band of silver, to give me the chance to practice a few of the fundamental techniques essential to the craft. 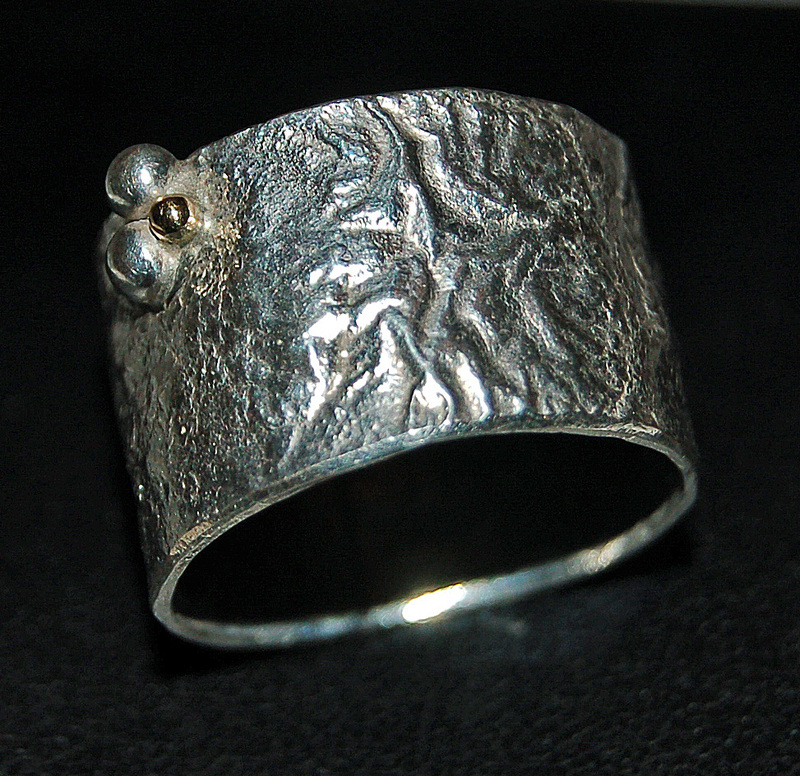 To make it a little more interesting, I was going to employ the technique of reticulation in order to give texture and interest to the surface of the silver before shaping the ring. When the surface of a sheet of metal is melted, a rippled texture is formed and, since this technique’s effects are completely random, the design created will be unique to the piece. It’s always difficult starting something new. 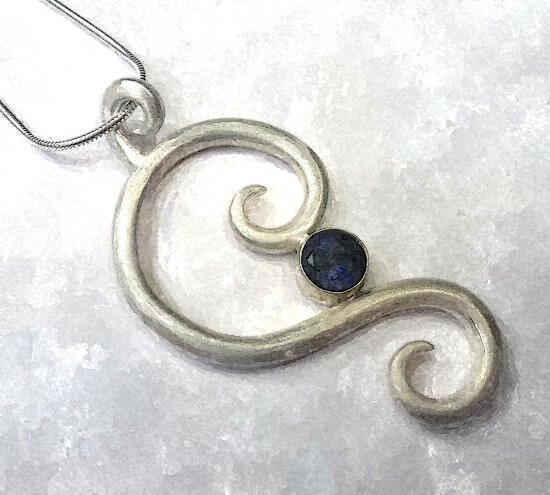 This is definitely something very new for me – I’m no writer, but I am a fledgling jewellery maker and I’d like to share my journey with whoever else out there might be considering diving in, not necessarily into jewellery design, but any craft or project for which they feel unprepared. I’m still pretty close to the bottom of this ever steeper hill, but I can confidently say that I wouldn’t change where I am for anything. So anyone out there who longs for a creative outlet, for something that just might make the difference between going quietly insane in their day job, follow me on my journey and you might just be inspired enough to seek a creative journey of your own. My first steps were an early birthday present. I’m a December baby (ok, not such a baby anymore) and my better half (Toby) though it would be an excellent idea to get shot of me for the weekend (my birthday fell on the Sunday that year) – charming you might think, but little did he know what the consequences of so rash an action were to be! 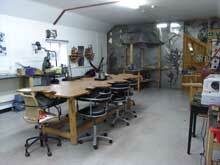 My present was a three day jewellery making course at Flux ‘n’ Flame Jewellery School. The school is run by Jesa and Al Marshall, Jesa recently winning a Silver Craft & Design Award; she’s also had her work highlighted in Vogue magazine. A lot to live up to! But, nearly two years on from that first taste of the magic of crafting with precious metal, I am now working on my own (albeit more simple) commissions and am regularly selling my work. A fabulous feeling. In my next post I’ll tell you all about my first tentative steps to creativity on that frosty birthday weekend in the dying days of 2008.